Edward Snowden became known to the world since he first identified himself as National Security Agency (NSA) whistleblower on June 11, 2013 from a hotel room in Hong Kong. His U.S. passport was revoked shortly before he left Hong Kong 12 days later, sending him scrambling to seek asylum in at least 21 countries. Most of them could not guarantee him safe passage, including Ecuador, one of his viable destinations. Stranded for 40 days at Sheremetyevo International Airport near Moscow, Snowden received temporary residence in Russia on Aug. 1, 2013, initially for one year, and subsequently for the next three years, through Aug. 2017. Joined by his girlfriend in July 2014, he currently lives in Moscow. The U.S. government has charged Snowden with espionage after exposing secret massive NSA electronic spying programs. He says that in its “War on Terror” the NSA has violated privacy rights and civil liberties. Snowden and his defenders cite the greater public good in exposing draconian surveillance programs that are illegal and unconstitutional. They also doubt he would ever receive a fair trial in the United States. We will look at some background facts on the Snowden saga and see what astrology adds to the story. In the larger picture, first of all, we note that though conceived prior to Sept. 11, 2001, the NSA mass surveillance program expanded exponentially after 9-11. This is confirmed by previous NSA whistleblowers William Binney, J. Kirk Wiebe, Thomas Drake, and Edward Loomis, whose testimonies and commentaries remained mostly ignored by the press and public up through June 2013, when Snowden came forward via selected members of the press. 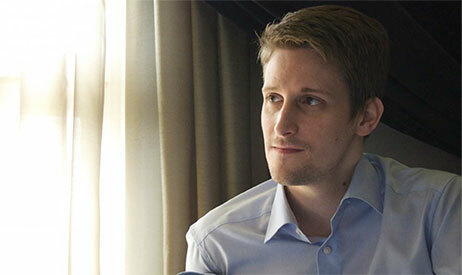 Snowden flew from his residence in Hawaii to Hong Kong on May 20, 2013. Upon his invitation, three journalists (Laura Poitras, Glenn Greenwald, and Ewen MacAskill) joined him there on June 3, 2013, and the first-ever installment of this explosive coverage was published in The UK Guardian on June 5, 2013. Along with citizens of other nations, the American public learned the true extent of government spying on its own citizens, contrary to previous public statements by President Obama, and sworn congressional testimony by NSA Director James Clapper and former NSA Director General Keith Alexander in March 2013. (These NSA Directors lied to Congress with no consequence.) The Church Report of Nov.1975 was supposed to end such excesses in government overreach, but Snowden revealed they were by no means over. He informed us that among Americans alone – 22 ½ million e-mails were being collected every second. This is in addition to mass collection of phone calls and search engine queries of citizens around the world. James Bamford, “The Most Wanted Man in the World,” Wired magazine, Aug. 2014. From fall 2001 to early June 2013 an entire 12-year Jupiter cycle had elapsed. In this case Jupiter returned to the sign of Gemini, re-entering Gemini (sidereal zodiac) on May 31, 2013. Jupiter and Saturn orbital cycles (12 and 29 years, respectively) and conjunction cycles (every 20 years) are extremely important in assessing socio-political-economic matters, and the Gemini-Sagittarius is an axis representing a kind of global nervous system, highlighting communications, publishing, and travel. Technology linked with information systems and data storage (now called “metadata”) was especially favored in the 20th century since: 1) late Dec. 1980 to July 1981 – the notable triple conjunctions of Jupiter and Saturn in Mercury-ruled Virgo, marking the real start of the Information Age; and 2) Sept. 1989 to July 1990 – triple Jupiter-Saturn oppositions in Gemini-Sagittarius. Soon after that, on Dec. 25, 1990, the World Wide Web was invented by British scientist Tim Berners-Lee in Europe. Until the World Wide Web, enabling global use of the Internet, most of the NSA’s dragnet electronic surveillance could not exist. Information is further expanded when Jupiter transits the Mercury-ruled sign of Gemini – an air sign noted for promoting the accessibility and/or sale of information, as Gemini also has strong mercantile interests. Coincidentally, the USA chart contains natal Jupiter in Gemini. (James Kelleher chart, July 4, 1776, 6:30 pm LMT, Philadelphia, PA). All together there are four planets in Gemini in the USA chart: natal Mars, Jupiter, Venus and Sun. Natal Mars at 0:40 Gemini makes it particularly ripe to be galvanized by the incoming Jupiter transit in Gemini from May 31, 2013 through June 19, 2014. In truth, all four planets in Gemini in the USA chart would be ignited by the presence of transiting Jupiter, soon to be followed by tr. Sun entering Gemini on June 15, 2013 and tr. Mars on July 4, 2013. Starting on June 26, 2013, tr. Mercury turned Stationary Retrograde at 29:03 Gemini, and in retrograde motion in Gemini through July 20, 2013. Thus, up through Aug. 1, 2013, when Snowden received his initial 1-yr Russian residency, tr. Mars, Jupiter, and Mercury were all in Gemini, with tr. Sun also in Gemini June 15 through July 15, 2013. From June 5, 2013 and throughout the 40 days he was stranded at Sheremetyevo Airport near Moscow, his revelations and his legal status were major news around the world. Also, prior to June 11, 2013, when tr. Moon joined the three other planets in Gemini, a New Moon occurred June 8th at 23:31 Taurus in Mrigashira nakshatra, whose imagery and mythology contain themes about a chase. President Obama also has natal Mars widely conjoined Rahu in Leo (2nd house in my preferred sunrise/Cancer Ascendant chart). After six years in office, his personal intelligence and rhetorical skills have not yet been matched by his actions in many areas – another manifestation of deception. Also, publicly he has more often catered to the Neocons (who previously promoted and planned the invasion of Iraq), while privately using his own more nuanced brand of diplomacy. Regarding whistleblowers specifically, during his 2008 campaign he praised them as “part of a healthy democracy [who] must be protected from reprisal.” But Obama has prosecuted more whistleblowers than all other U.S. presidents combined. So we see how this Mars-Rahu combination keeps reappearing in surprising ways, confounding our expectations, as befits the unpredictable and unconventional energy of Rahu and Ketu, two halves of the serpent. Meanwhile, we should understand that Jupiter has the capacity to facilitate growth in whatever zodiacal area it is passing through for on average one year, more so in certain signs and elements. It was especially effective with tr. Saturn also in an air sign (Libra) during the entire period tr. Jupiter was in Gemini (June 2013-June 2014), enabling the two major timer planets to work more in tandem. Snowden wanted a public debate, and indeed during this time the topic of massive intelligence-gathering became a central, if not explosive topic, along with both praise and vilification of Snowden. Clearly an enormous boon for those involved in marketing and surveillance, metadata collection is also potentially threatening for personal privacy and communications that are no longer safeguarded. Personal information can be used indiscriminately to target and criminalize innocent citizens. Between nations, it can create enormous distrust. Before Snowden: Behind the Curtain, 2014. The potential risks to any whistleblower have become enormous, including death, imprisonment, vilification and at the very least, years of harassment and/or criminal prosecution. He or she must have strong convictions to take action, much like the investigative journalist feels his or her duty as part of the Fourth Estate to report on events around the world, often in the process contradicting official narratives. Also, the whistleblower should have integrity. If not, they can be accused of taking action mainly for profit or inadvertently for profit. Some of these accusations have been leveled at Snowden. For instance, many book and movie deals have been made with his close journalist colleagues, with Snowden often the central focus. Less than 2% of the NSA documents from Snowden have been revealed to the public from early June 2013 onward. And even when published they were vetted in advance by the U.S. government at least 100 times. Some critics have asked whether any of these proceeds have been shared with Snowden and questioned why he would turn over all the documents to others without any further personal control. Glenn Greenwald and Laura Poitras are the chief recipients of the NSA documents from Snowden, and questions about conflict of interest have been raised since they formed a publishing partnership (The Intercept) with eBay founder Pierre Omidyar in late 2013, funded by Omdiyar initially with $250 million. As owner of eBay and parent company of PayPal, Omidyar is close partners with the U.S. government and NSA, and hostile to whistleblowers in the past. A Mars-Rahu combination also occurs (this one in Taurus) in the chart of the U.S. Dept. of Defense, established by President Harry Truman on July 26, 1947, 12:15 pm EDT, Washington, D.C. Prior to administrative restructuring and the establishment of the National Security Agency on Nov. 4, 1952, the U.S. Dept. of Defense and the Joint Chiefs of staff had authority over the cryptological community. The Dept. of Defense chart has numerous excellent financial yogas (planetary combinations), as you might expect of the largest military establishment in the world by far, still outspending all other nations combined. Mars and Rahu are in the 9th house of this chart, confirming the special role of intelligence in the American military, the potential for manipulating or bypassing national and international laws, and the ongoing expansion of the U.S. military, now called the “military/industrial/surveillance complex.” Virgo is the Ascendant of this chart with Mercury and Venus in Gemini in the 10th house of highest status. It may seem odd to realize that prior to July 1947 there was no U.S. Dept. of Defense. But in 1940-1941 three JU-SA conjunctions occurred in fiery Aries, ruled by warrior planet Mars. Major planetary harbingers of the Atomic Age, these conjunctions were followed 40 years later by three JU-SA conjunctions in Virgo, ruled by Mercury, master of communications. To have two sets of triple JU-SA conjunctions within the same century is relatively rare. It shows high intensity and acceleration in this case combining military motivation and technological inventions. The Atomic Age evolved out of the FIRE to EARTH Mutation period (1901-1961) and into the larger EARTH period (1921-2199), when JU-SA conjunctions occur predominantly in sidereal EARTH signs. With focus on material security, technology thrives as never before, but is increasingly used for military purposes and promise of greater security for all.